Patchwork n Play: It's finished! I am very proud to share my "Birds of a Feather"
in the Mid-Century Modern Bee! I hope I have done justice to their beautiful feathers? It finishes at about 60" square. the obligatory 'rolled up' quilt! and lounging on a seat! And, by the way, I love it! Suz, this is the most wonderful quilt!! The quilting sets off the blocks perfectly and as always I love your photos!! Congratulations on an awesome finish!!! It is just beautiful!! Love how it all came together and the scrappy binding is perfect! It is gorgeous! I love the way you've put the feather diagonally and the quilting really sets it off. It is beautiful, Suz! I like the colors a lot, not to speak of the nice feather blocks and the diagonal setting. 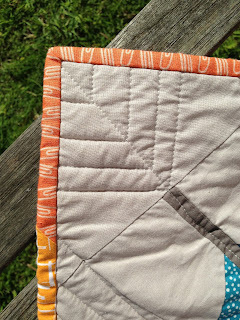 And I love that scrappy binding! Oh, how beautiful!!! I'm a quilt worrier, too. It's my least favourite part and I have to really force myself to not just do the bare minimum to hold the layers together! And I do worry that I'm going to ruin a top with rubbish quilting. Yours is perfect for your feathers!! It enhances them and adds interest without overwhelming them. Nice job!! It looks great, you must be thrilled to have it finished. It looks wonderful!!! 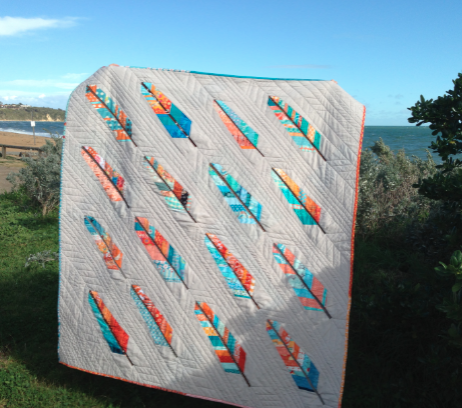 I love the colours (as yo know) and your layout and quilting suit it perfectly! A very fulfilling finish. I've not seen Aurifil thread in real life yet many rave over it. What is so good about it? What a beautiful quilt! I love the colours and the quilting is just perfect. Your quilt is just so beautiful!! Looks brilliant to me Susan! And I don't know why you worry about the quilting it looks great too! Love those echoing arrows! This quilt is just too amazing!!! I am so thrilled to be a part of it!!! 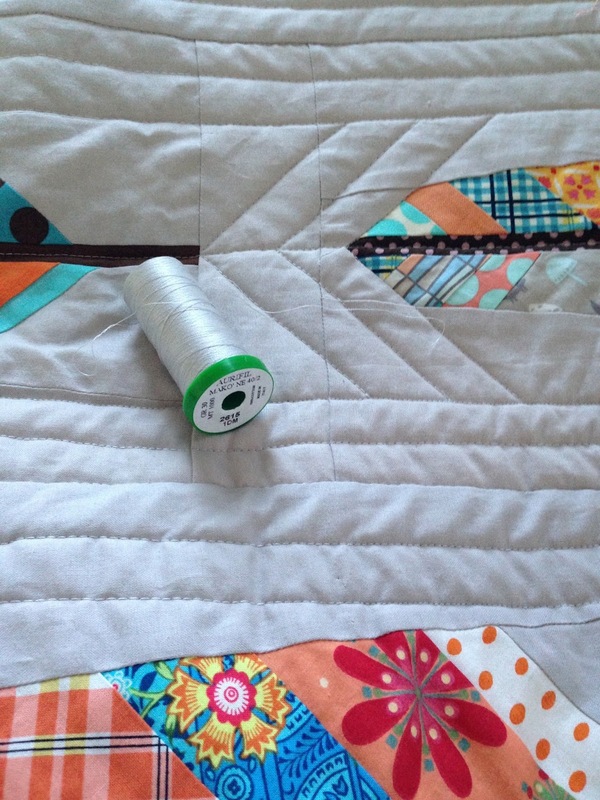 Your quilting is perfect and I love what you did with the signature blocks!! What vision to request these blocks and then create such a beauty Susan! So honored to have a small part of my piecing in your quilt! Perfect in every way. Gorgeous! Besides the angled setting, I love the scrappy binding. It adds the right amount of interest to a block that's already brimming. Congratulations on a wonderful finish!! I love everything about this quilt. Gorgeous! Oh my goodness this turned out so awesome!! I adore your quilting on it and love the variety in the background too. Nice job on the soggy block too! This is a beautiful quilt! 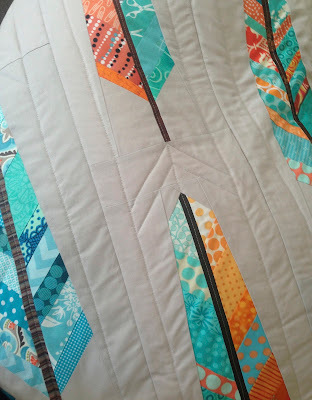 I love the quilting, those arrows add just the right touch. Oh my!! I think you did a fabulous job! Glad you are happy with it. Happy to be a small part of it. EEEE!!! It's just stunning. Absolutely amazing. Your quilting did the quilt proud. Enjoy it!! Susan it is stunning! 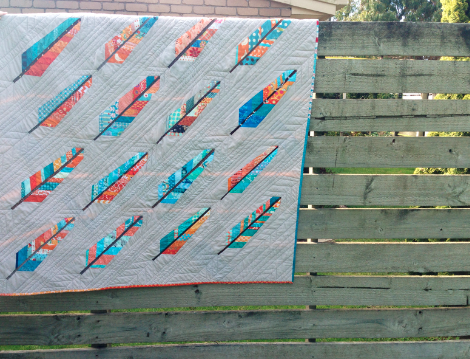 The colours are fabulous and I love your quilting, those arrows look amazing! Love it... The colors are wonderful! I join the flock of birds above me to say how much I love your finished quilt, Susan! Your setting is brilliant and worked well with all of the various sized feathers. I like what you did with the quilting too...no need to fret, that's for sure! My favorite of all of your great photos is the one on the chair...you should have it made into greeting cards! Absolutely beautiful! I think the quilting suits it perfectly. I love all of the pictures. Well done! 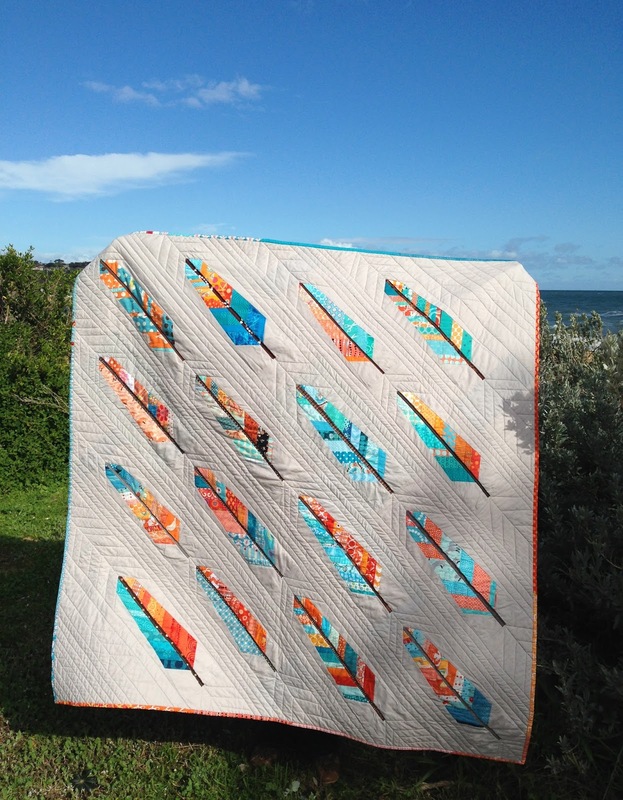 Oh Suz this is gorgeous, what a fabulous quilt, and you made it onto Aurifil's facebook page. Love the full frontal photo! This is a beautiful quilt! And I love your machine quilting-I think it's just a perfect addition to emphasize the feathers. You have every right to LOVE it. It is a wonderful quilt. Absolutely stunning Susan. 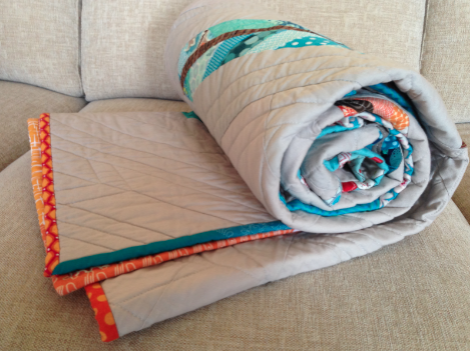 I think the quilting is perfect - and I love the binding! This turned out beautifully! Love it in every way. Holy Moly is this good! It looks like it could take flight! You should not worry in the least about your quilting....it is exceptional! Brilliant to echo the shape of the feathers! I love the back...it works with the front. Almost has a Navajo feel to it! Absolutely perfect. I remember when you wondered how you put them together....this is a great finish! Oh my, Susan! Look at all the comments on this quilt! I'm especially happy that you managed to incorporate a couple color variations of gray, since I'm the one who messed up and had to substitute. But it looks SO nice like this. 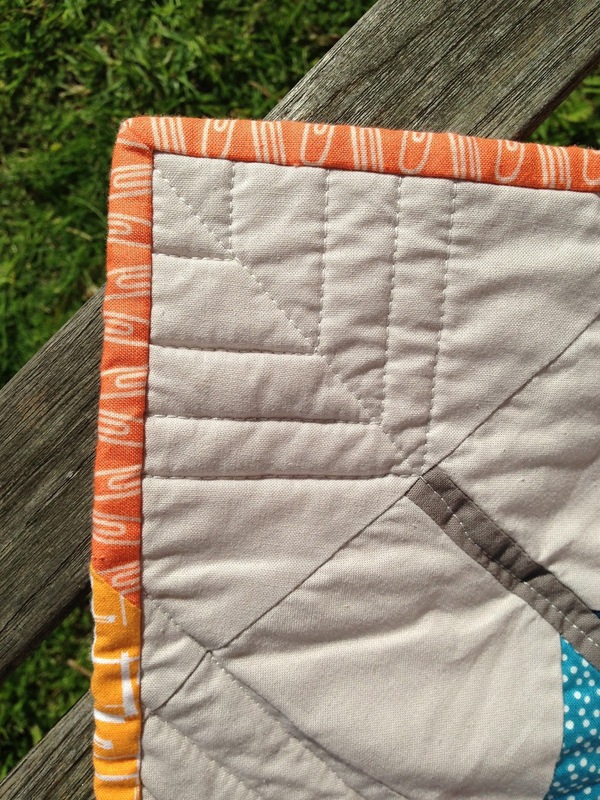 Love the diagonal layout of the blocks, and the way you reinforced that with your quilting. No stressing! You did great! I've never used #40 weight for quilting, always sticking with #50 (orange spool). Your quilting shows up nicely in pictures, but do you like it in person? The quilt a great size too. Really, a perfect finish. Excellent! Oh your quilt is sooo beautiful! Love the quilting and picture backdrops! Congrats on the finish! This is a beauty of a finish. You do a fantastic job with the backing and the quilting. It shows off the feathers so well. Gorgeous Suz, no need to worry about the quilting its looks fabulous!! I am finally doing some catching up. This quilt has worked out so well. It looks amazing. It has been great to follow your progress. Gorgeous! I love the layout you decided on. I hope you're showing it off to everyone. I have seen this in various stages of completion, but to see all those wonderful pictures is such a treat for the eyes. 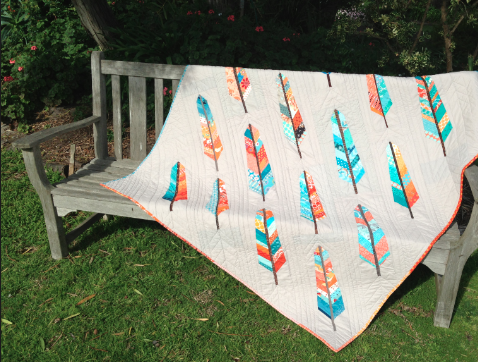 Your quilting is perfect and I do love how it echoes and reinforces the idea of the feathers. I can see the different grays in that one photo, but really don't notice the difference in the grand scheme of things--perhaps it just adds texture and visual richness. The binding is perfect, the layout is brilliant--this quilt is such a success! Congratulations on your FAL finishes, too! Suz, it's absolutely gorgeous! I love that you angled the feathers - it adds such movement and drama to it... I have loved watching these feathers pop up around the web and am so excited to see it finished. Beautiful work! Mmmm! Gorgeous! And made by friends to boot! 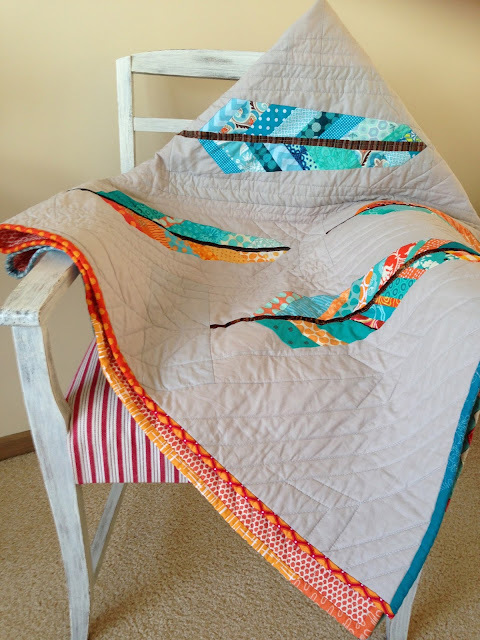 Love the colors and quilting too! the pattern and especially the chosen colors are stunning! perfect work! FUN! 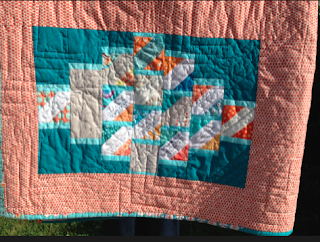 Great movement with nice quilting. I am wondering about palcing the feathers in a circle??!!! Thanks for sharing. Was I out of town when you posted this? I can't believe I missed the finish of this absolutely stunning quilt. I'm so thrilled to have you in the MCM bee, Susan. Your setting is brilliant and I love the way you used the signature blocks on the back. Really REALLY beautiful! Oh my gosh this quilt is incredible!!!! I louuuurve it *heart* I might have to add a feather quilt onto my wish list of projects that I love. Love this -the blocks and the colours. That is the most amazing quilt - you should be very happy with it as it looks incredible. That is one incredibly beautiful quilt. this is really beautiful. I also find the quilting part the most stressful. Yours looks great! It's gorgeous! Love the colours! Do you have a pattern for this? This is amazing! Kiley, this is my only way of replying to your question as you are a 'no reply blogger'! I hope you see this. The Feathers themselves are an Anna Marie Horner pattern available free on her website. The construction is my own design- kind of made up as I went along. Sorry! Sorry I didn't realize I am a 'no reply blogger' I'll have to change that:-) I will look for the Anna Marie Horner pattern then and just try to do what you did. I love love love this. Thanks so much for your reply!